There are many misconceptions about the construction industry, magnificent buildings are constructed but somehow it’s easy to forget the incredible amount of skill required – and the men who knowingly put themselves at risk every single day. HSE statistics show that construction workers are six times more likely to be killed at work than any other worker. The good news is that health and safety regulations have improved which have reduced the number of accidents; however some risks still remain. Below are some of these risks as well as the legislation that is in place to safeguard the workforce. Nearly half (44.7%) of all fatal injuries have been falls from height, clearly highlighting the need for change. As well as general health and safety legislation, The Work at Height Regulations 2005 was produced to prevent death and injury caused by a fall from height. 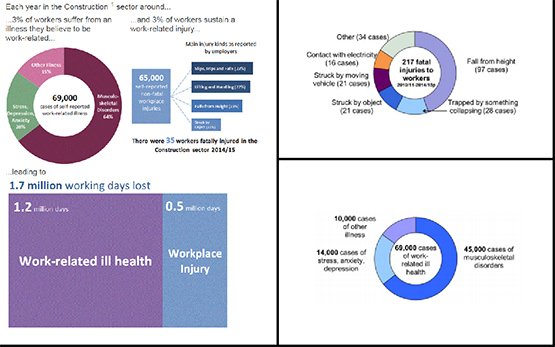 Between 2011/12 and 2014/15, approximately 69,000 construction workers in the United Kingdom have suffered from what they believe to be a work-related illness; 45,000 (65%) were musculoskeletal disorders (MSD). The Manual Handling Operations Regulations 1992 have been produced to reduce the risk of Musculoskeletal disorders. The idea that asbestos is a problem of the past is a mistaken one, Cindy Lovell of Alcumus says there are approximately “500,000 public buildings in the UK that contain harmful asbestos materials”- asbestos is the biggest occupational disease risk to construction workers.